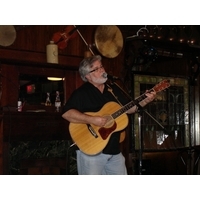 Bob Ray is an award winning singer-songwriter from from the hills of north Mississippi. He has been writing and performing for more than 25 years. He has twice been named a Kerrville Folk Festival - New Folk Songwriting Finalist. He has been a finalist in both the Ozark Folk Festival Songwriter’s Festival and the Gum Tree Song Festival. He has performed at the Mississippi Songwriter's Festival, the New Orleans Song Festival, the Nashville Songwriter's Festival and the Frank Brown International Songwriter’s Festival in Perdido Key, FL. Additionally, he has won awards from the Woody Guthrie Folk Festival-Songwriter’s Festival, the Smokey Mountain Songwriter’s Festival, the Acoustic Roundtable, the American Song Festival and the Music City Song Festival. He has shared concert, club and festival stages with performing songwriters such as Marty Stuart, Keith Sykes, Tracey Nelson, Paul Thorn and Walter Hyatt, among many others. Bob’s music has often been selected for popular radio programs such as “Folk Sampler” and “Grassroots” on the National Public Broadcasting System. Please visit his webpages www.myspace.com/bobrayinfo & www.sonicbids.com/2/EPK/?epk_id=209153 for more information and to listen to songs from the new CD, “Mirrors & Windows” released in 2017.